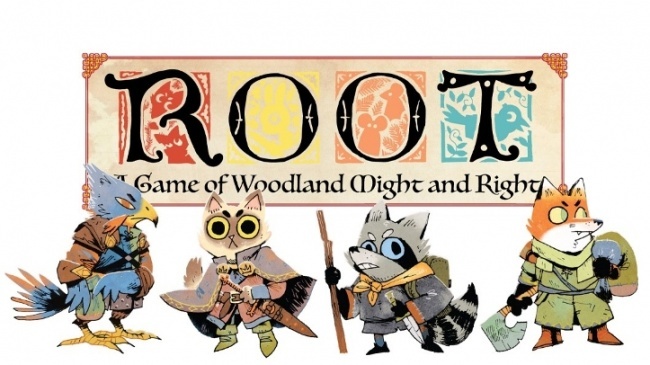 St. Paul, Minnesota publisher Leder Games will release Root: A Game of Woodland Might and Right, an asymmetric adventure game in Fall 2018. The project is currently seeking funding on Kickstarter. 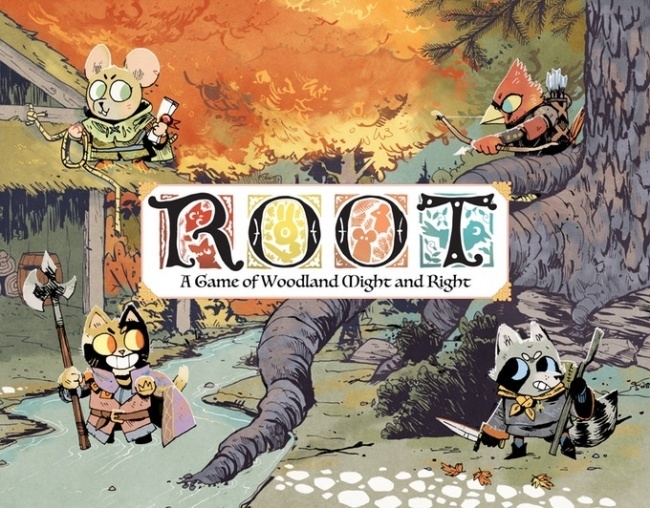 Root: A Game of Woodland Might and Right is an asymmetric game of war and conquest that casts players in the roles of various woodland factions, each with unique powers and goals. The Marquise de Cat has recently taken control of the woods with her army of cats, and plans to harvest the riches of the forest for herself. The displaced Eyrie birds of prey are seeking to return to power to rule over the kingdom they see as rightfully theirs. The Woodland Alliance is quietly gathering to upset the balance of power and create a new order. The Vagabonds venture where others won’t, but can be convinced to aide different factions, though in the end, they have their own motivations. Each player has different victory conditions, and with the aid of multi-use cards, anyone can end up in control of the forest. The box contains 60 cards, 80 wooden warriors in 5 colors, 80 thick chipboard tokens, 5 mounted faction boards, 2 D12, a mounted woodland map, a reference rulebook and a learn-to-play guide. The game is for 2 – 5 players, ages 10 and up, and plays in 60 – 90 minutes. Estimated MSRP is $60.00. Trade release is planned for Fall 2018. The Kickstarter has raised $170,000 from more than 2,300 backers as of this writing, with 21 days to go, well over its $24,000 goal. The Kickstarter includes a $5 retailer level (Alliance), which will allow Leder Games to contact the retailer with retail backer options. Leder Games’ other games include a rummy-style Trick or Treat card game, and the asymmetric cave-crawling adventure game Vast: The Crystal Caverns. In Vast players explore the cave as different characters, each with unique attributes and victory conditions (the knight, the goblin horde, the dragon, the thief or even the living cave.) MSRP is $59.95. The game is for 1 – 5 players, and includes several solo modes. 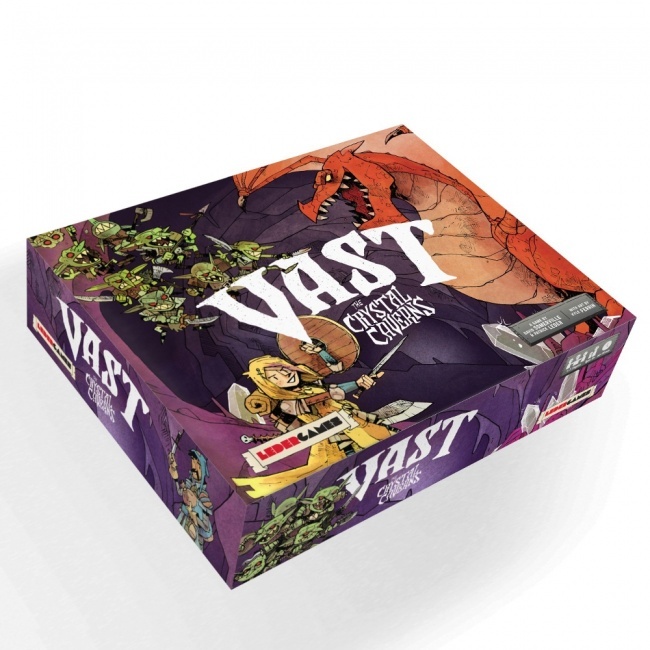 Two additional products for Vast will be available to retail in February: Vast: The Fearsome Foes an add-on pack, and Vast: The Crystal Caverns Miniatures. Vast: The Fearsome Foes adds three new roles (ghost, ghoul, and nightmare unicorn) to the game, expanding it to up to 7 players. Each role includes a detailed miniature, wooden meeple, card set, and player mat. Vast: The Crystal Caverns Miniatures add a new dimension to the game with highly-detailed miniatures for the characters, plus treasure chests, crystals, vaults and the entrance to the cave. MSRP was not announced for either product. See multiple game images in the gallery below.